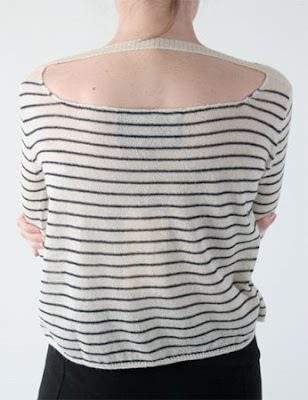 ooh the back on that boatneck sweater is so nice. i love her resort collection, it's perfect. ...just found you by way of D.C. Urban Outfitters Blog. Excuse me, I'm off to get a full cup of tea so that I can sit here and really cruise around for a while! i love the stripes... i could always use another striped top, especially with the open back!